*There are no holes or rips on the shoes. All seams intact. *The soles are slightly dirty15731. * Looks used briefly to try out, should clean up easily. Arc'teryx amazes the outdoors community with its protective, innovative, and performance-driven products, and the new Women's Acrux FL Approach Shoe is no exception. The Acrux FL has that same unique style and performance that we all expect from Arc'teryx. For starters, Arc'teryx constructed the Adaptive Fit liner separately from the upper in order to hug your foot with breathable, quick-drying mono-mesh for a truly customized fit. The Acrux FL also features a lightweight and surprisingly durable seamless upper designed to handle rock, snow, and ice with ease. This upper features a non-woven, DWR-treated internal surface that sheds wet weather, PU-coated nylon for air permeability and abrasion-resistance, and TPU film for enhanced support and durability. The two top lace holes have integrated reinforcements to reduce stretching. Underfoot, Arc'teryx equipped the Acrux FL with a premium injected EVA midsole designed for stability and enhanced braking. 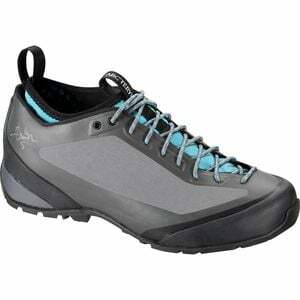 The 3D molded toe and heel caps buffer impact, offer rock protection, and resist cracking for durability. There's also an anatomical arch shank, and the custom-developed 3D molded Ortholite footbed offers maximum comfort and breathability. Vibram's brand new MegaGrip rubber makes the Acrux's sole fine-tuned for any trail. Design features include a climbing zone with traction grooves, grippy inserts for smearing, RockGrip technology with anti-slip lugs, and a spherical heel shape for a smooth stride.